Fabric Mart Fabricistas: Made by a Fabricista: Jumping into Fall! Even though I live in the "Sunshine State" and it feels more like Summer most of the year, I do plan to create and add a few Fall pieces to my wardrobe collection. Before the end of the year, my goal is to challenge myself and create a few sweater tops and a coat. I came across this beautiful polyester fabric and originally planned to make a dress Vogue 9327. 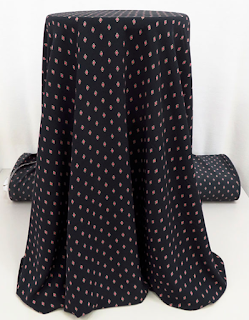 After being indecisive with a few Fall planned pieces, I opted to use the fabric to create a Fall duster instead which I know for sure I will wear more frequently since I am not a big fan of dresses. Unfortunately, this fabric is no longer available but I would use any of these beautiful rayon challis fabrics here or here. The duster was created using an easy sew pattern from Simplicity sold exclusively in Walmart. This pattern is pretty much identical to New Look 6514 that Imade last November here. I was able to finish the entire look in under 3 hours from start to finish and is very pleased with the MEDIUM size and fit. The only modification that I plan to make the next time around is lengthening the facing of the neckline. I did make a few modifications to the VIEW B by removing about 8 inches from the length for a shorter look and added a slight high low curve on the hemline. I also decided to keep it simple with VIEW A sleeves. Now this beautiful sweater fabric from Julie's pick for the month of August that is NOW available for purchase here is absolutely perfect for the top that I wanted to create using McCalls M7721 (View A). I definitely plan to make other views with slight modification to the neckline. I am in love with the texture and the colors of this sweater knit which is a perfect transition to Fall. Opted to just serge the sleeves for a fun look. Have you wrapped up your sewing plans for the next few months? This weekend, I plan to finalize mine so that I can use up a few yards of my Fabric Mart great finds. Thanks for reading and don't forget to stop by the blog to check out my latest makes! 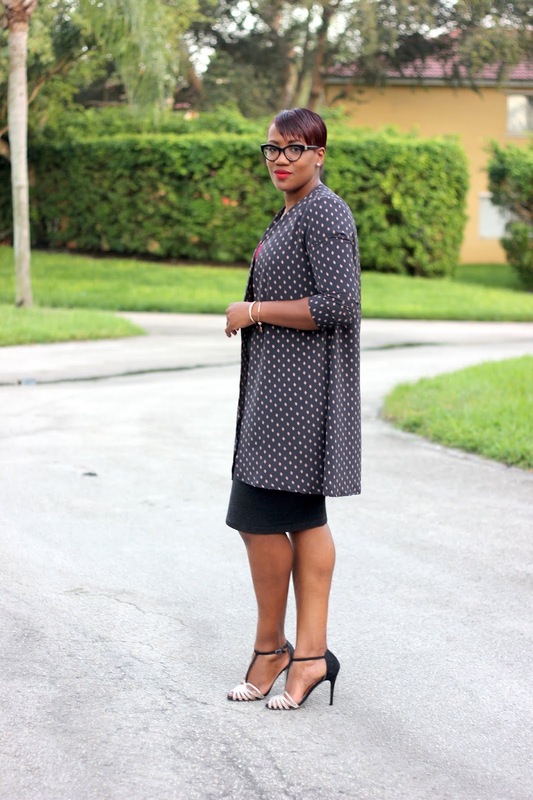 Love your duster and you look great in your pencil skirt. I love your duster, it's just the thing for fall. Great choice.